I must admit that after 'Voices Of Animals and Men', I fell out of love with the Young Knives. Not because 'Superabundance' was bad (remember how good 'Terra Firma' and 'Turn Tail' were?) just I’d had enough of the whole art-rock, post-punk revival sound. Moving on to 'Ornaments From The Silver Arcade', and the band are well and truly back in my good books. Recent single 'Love My Name' starts the album, admittedly with the typical jaunty guitar expected from the band, but even with that it sits as a fantastic song. Simple as it may be, it's far catchier than some of the lad-rock revival bands coming forth now could ever be, and even better it gives you a sense of the force the band could have live these days. By the time you get through the album, to another stand out track 'Human Again' it begins to feel just a bit same-y. Not enough to put you off the album, and considering we’re now the shuffle generation, how many of you will listen to the album all they way through anyway? Ending on my personal favourite track 'Glasshouse' - a gentler number, yet with all the spiky guitars and shout-along lyrics that you’d expect - it does a brilliant job of leaving the listener wanting more. With its closing refrain of "I tried not to be here" alongside keyboard pips and crashing drums, it has the power to stay in your head for days, and that’s me speaking from experience. There is an underlying synergy through the album, yes the songs sound the same, but does it really matter? Young Knives clearly are good at this kind of thing or they wouldn’t be on their third album (well if we’re being technical album number 3.5). And as the saying goes “If it ain’t broke don’t fix it”, this most certainly doesn’t need fixing. 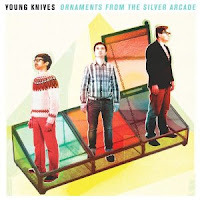 Purchase 'Ornaments From The Silver Arcade' from your local retailer, Amazon.co.uk, iTunes etc.